Water is California’s gold. Groundwater basins are a battle ground where landowners must protect their water rights from modern-day claim-jumpers who include well-financed entrepreneurs seeking to sell or export our water. Where does that leave landowners? Unless home owners and landowners take steps to protect their rights under California’s law and constitution, entities attempting to sell or export our groundwater water will take away or limit groundwater rights. Protect Our Water Rights (POWR) is a newly formed group of overlying landowners who, by virtue of owning their property, have the right to pump and reasonably use water on their land. POWR has filed an action called “quiet title” in San Luis Obispo County Superior Court. Quiet title is simple. Landowners are asking the court to confirm their right to pump. This doesn’t mean that we will be embroiled in years of litigation. The governmental entities named in the suit can simply affirm they are not making any claims to limit or take away our water rights. If they take this simple step the case is over. We hope that our elected leaders take this wise and cost effective course of action. A broader adjudication will be triggered if the governmental entities take the position that they are seeking to take away existing landowner rights. At this point the decision lies with our elected representatives. A second group, Paso Robles – Water Integrity Network (PR-WIN) has been formed to oppose the recently passed urgency ordinance. Our Supervisors decided that they had the right to vote away the water rights of landowners. PR-WIN filed a Writ of Mandate, a lawsuit seeking to reverse this unlawful and improper government action. Protection of our water resources is important and must be done in a measured way that protects the rights of everyone. The urgency ordinance was passed by a governmental entity which conveniently exempted itself from the water use limiting provisions of the ordinance. The pain of limited water use falls on landowners and farmers alone. I’m concerned that the longer range goals of governmental entities are to sell and or export groundwater from the Paso Robles basin. If that is not the case, the entities can file papers in court that affirm that they are not making any claims to take away our groundwater rights. Water policy in the Paso Robles basin is at a crossroads. We can take a measured, common sense approach. This would involve repealing the urgency ordinance in favor of a more measured science-based set of policies. Alternatively, we can determine everyone’s rights in court and let the judge manage the basin. Which way this goes is up to our elected officials. 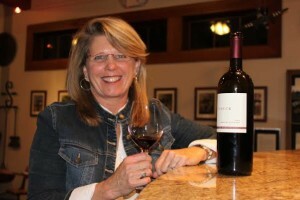 Cindy Steinbeck is a fifth generation Paso Robles, farmer working with her parents, brother and son at Steinbeck Vineyards and Steinbeck Vineyards & Winery. She is president of their various businesses and serves as director of marketing, sales and public relations. Cindy created CRASH COURSES in her vineyard, providing an educational experience into wine through the eyes of the farmer. I would like to again state that whatever the outcome of the political wrangling of the PRAAGS/PROWATER groups for control of a “governance structure”, under no circumstance should there be any mention of “WATER BANKING” in the AB3030 plan or the Water District being proposed. In the most simplistic terms, Water Banking will lead to export of water from our basin. People can say that that is not the goal, and it very well might not be, however the powers that are lurking will gain control of the WATER DISTSTRICT BOARD via the voting set up and will do exactly what is stated in the article mentioned below. Notice that Paramount, the owner of Justin Winery is mentioned prominantly in this article. They are a major player in the PRAAGS/PROWATER move to establish the Water District… I wonder why? The PRAAGS guys just want reliable water and who can fault them, but so does Paramount/Justin, just for very different reasons. PRAAGS just doesn’t know it yet. I am at least giving them the benefit of the doubt here. If they dont wake up soon and smell the coffee, they will be the laughing stock of the County. At #30 on the list is the Steinbeck Vineyard, in the amount of $155,396. So for those wondering if the general public is subsidizing the over-pumping of the Paso aquifer, the answer is in the affirmative. Actually, the Federal Government subsidizes agriculture of all kinds for a myriad of reasons: chiefly among them, that private farming is an intensely risky endeavor, subject to market externalities that can swing a farmers’ livelihoods from modest profits to debilitating losses. Your County also subsidizes through tax incentives of all kinds home developers, golf courses, water parks and all other kinds of intensely water responsible endeavors in the North County. The entire water issue is a failure of government, regional planners, land owners of all kinds and all North County voters over the span of 20-30 years. Voters failed to elect leaders or vote for the funding measures that would have been required to secure water replenishment for the Basin over this time. With no accountability and no funding, an unbridled “pro-growth” agenda took hold of citizens and politicians. Growth in agriculture. home building, golf courses, etc. The ranchers and farmers were here long before the 2 acre home lots with vanity rows of Syrah. In the end, however, it is immaterial. All of us are now sleeping in the bed we built over 2 decades of self interest. I find it interesting that through all of the Board of Supervisor’s deliberations on the urgency ordinance we had to listen to Ms. Steinbeck explain to us how she is a “fifth generation farmer” and that her son would be denied the ability to carry on the family tradition if the urgency ordinance passed. Nothing in the urgency ordinance told her to stop what she was already doing. I found it strange that a small, local farmer would be against an ordinance that was supposed to stop new development. Especially with all of the large scale vineyard development going on in the Paso Robles area. This is big competition for the small farmer. It is apparent in her opinion piece and recent actions that Ms. Steinbeck is looking for a court action to allow her to continue pumping water with no concern for conservation. She wants to be able to continue business as usual and, with a decision from the court, she hopes she will not be held liable for drying up neighboring wells. Who is this “boogie man” that is trying to sell and export our water? I might buy your theory if we had water bubbling freely out of the ground. Obviously not the case. As far as water banking, where is all of this water coming from that everyone thinks will be banked here? What Ms. Steinbeck fails to recognize is that if current practices are allowed to continue, the end is near for the vineyard industry in the Paso Robles area. There are no other sources of water. Thankfully there is a property owner that understands, no action is considered to be negligence in the eyes of the courts. Negligence is how a legal taking is justified in the end. All else is the smoke screen used to convince public opinion and many to just look the other way. A majision uses a simular technic as most are not qualified to see what is really going on. Remember that honest or not, the law will remind you that ignorance is no excuse. Agreed, that is exactly what Steinbeck is doing with the suits. We all should be thankful she is making her voice known. I’m amazed that there are people that believe they have the answers. I’ve studied this problem for several years and to tell you the truth, there are are no good answers. However, what should be done is allow everyone to have a word, which appears to be what Cindy Steinbeck is doing. Did the County overstep the law? Again, this is for the courts to decide but reminds me of what the Paso Robles City Council did some years back with the Nacimiento pipeline et al. The citizens made the council follow the law instead of deciding things themselves without the public’s involvement. That’s looks to be what is happening here and local farmers like Steinbeck are asking for their word to be heard legally. The citizens in the city of Paso Robles may in the end, have to pay more for water. Let’s face it, those inside the city still have rates that are reasonable but in tough times like these, we all have to pay more … not just rural farmers. We in Paso Robles have a water problem and something has to be done – but let’s do it lawfully. That is a confusing perspective. There was already a process that was and is ongoing that included all interested parties. The BOS only set aside time for solutions to be found without further damage occurring. What Ms Stienbeck did was publicly profess she knew better than anyone else and started a process that requires giving into the demands of her small group (not inclusive) or we end up with adjudication with the state dictating local issues. This is an important part of the equation….are govt. subsidies afforded grape growers? Technically, wine grape growers can get federal subsidies. However, subsidies are funded by Congress in the “Farm Bills” and specialty crops (fruits, nuts, grapes, etc.) are not the ones that get funded. Rice, corn, cotton, wheat, soybeans, etc.usually get the big funding for subsidies. Wine grape growers do get state disaster aid and can apply for federal disaster aid. The state also has other types of funding for conservation and of course, the Williamson Act provides lower taxes for ag preservation. The state no longer reimburses the counties for the lost taxes and last year the county picked up the tab for Williamson Act property owners rather than raise their taxes. This is my understanding, and I’m sure that others, more knowledgeable, can be more specific about what is actually available. Wow, someone who can think critically for themselves! You are correct, you are almost perfectly on track, the water is needed for developers, but not here, the water under our feet will be transferred out to Southern California Developers who only need to show “allocations” for water to get their projects permitted by their local government. This is where it comes together to create a private water market that uses “paper water” to transfer those “allocations” without having to provide actual water meaning the wet stuff we drink. Billionaires do this at rediculous profits at tax payer expense. People often wonder how Billionaires become Billionaires, well it is done out of sight in markets that they create predominantly at the expense of the rest of the population. This is a very heady topic and complex, there are many layers at work here, just look into the SLO WATER BANKING FEASABILITY STUDY OF 2008. Just follow the money!